The Economist takes up the challenge. Obama's proposal takes the more modest Senate bill as his basic framework. But, in what is perhaps his proposal's most notable feature, he scales back the Senate bill's main revenue source, a tax on high-cost insurance that he has strongly supported. Instead, he would impose a new tax on the unearned income of the wealthy. In my view, this is a step in the wrong direction. The tax on so-called Cadillac health plans made sense as a way to reduce the existing tax incentive toward excessively generous health insurance, which in turn encourages excessive use of healthcare. That reform is, apparently, now gone. Instead, the current administration proposal is to increase the tax on capital income, reducing the incentive for saving and investment. In other words, the new proposal would do less to bend the curve of rising healthcare costs and more to impede long-run economic growth. This change was probably made to attract more House Democrats. It will likely make the plan even less attractive to congressional Republicans. By the way, according to CBO director Doug Elmendorf, the new administration proposal has too few details for the CBO to provide cost estimates. Perhaps more details will be available in the days to come. President Obama will propose on Monday giving the federal government new power to block excessive rate increases by health insurance companies, as he rolls out comprehensive legislation to revamp the nation’s health care system, White House officials said Sunday. Very, very strange. You would think that all those future Nobel-prize-winning economists working for the President would explain to him the history and economics of government price controls. Imposing price controls certainly wasn't President Nixon's finest hour. Maybe President Obama should instead follow in President Ford's footsteps and start wearing a WHINE button on his lapel, for Whip Healthcare Inflation Now, Egads! Feckless would be one step better than counterproductive. Union leaders such as Mr Trumka and Andy Stern, the leader of the more moderate Service Employees International Union, are regular guests at the White House. Mr Obama has revoked some Bush-era executive orders that unions hate and issued a few they adore. He has appointed union insiders to top jobs, allowed Congress to add “buy American” provisions to the stimulus bill, risked a trade war with China to please tyre-workers, let other trade deals wither and brazenly favoured unions when bailing out car firms. But his biggest favour has been green, foldable and borrowed. For example, he encourages the use of “Project Labour Agreements” on big federal construction projects, whereby contractors must recruit through a union hiring hall. Such agreements inflate costs by 12-18%, according to David Tuerck of Suffolk University, and were banned under Mr Bush. Even where PLAs are not in force, federal contractors are obliged to pay “prevailing” wages. That actually means something close to the union rates, which is nice for the workers in question but means that taxpayers get fewer roads and schools for their money. I enjoy good memoirs. At their best, they can give you a sense of what it would be like to lead a different life, to walk in another's shoes. Political memoirs are usually a disappointment, as the writers typically have an agenda, such as establishing a place in history or angling for the next job. They seem more like spin than truthful self-assessment. Memoirs by nerdy academics, rare as they are, are among my favorite, in part because I can easily see myself in them and in part because the authors are often brutally honest. All this is a prelude to a book recommendation: My Life as a Quant: Reflections on Physics and Finance, by Emanuel Derman. I have never been a physicist or worked on Wall Street, but this book gives a good sense of what both career paths are like. The book was written, by the way, before the recent financial crisis. As a result, one does not get a sense of how the author would put recent events into perspective. But by the end of the book, the author is skeptical enough about the use and abuse of financial models that I suspect he would not be terribly surprised when they went awry. Here is a question I have been pondering. If you were a member of the fiscal commission, what would you try to achieve? The answer for liberals is easy: They want to raise taxes to fund the existing, and even an expanded, social safety net, while politically insulating the Democrats as much as possible from the charge of being the "tax and spend" party. President Obama can then campaign in 2012 that he did not break his no-taxes-on-the-middle-class pledge, but rather a bipartisan group broke it. That is, the President wants to take credit for fixing the fiscal situation but duck responsibility for having imposed higher taxes. But what if you are conservative? This is harder. You can try to stick to your no-tax-increase position. The problem is that doing so would require spending cuts larger than are politically realistic. If I were king, I bet I could find sufficient spending cuts. But I am not expecting to be anointed any time soon. If the fiscal commission is going to succeed, tax increases will have to be part of the deal. A reasonable position is, perhaps, that the commission should not succeed. After all, it is the president's responsibility to put out a budget. The one he just released is, as I explained in my recent Times column, not sustainable. He just passed the buck to the fiscal commission. Perhaps conservatives should not allow him to do that but, instead, should try to force him to put out a sustainable budget on his own. After all, isn't that Peter Orszag's job? But let's suppose that you are a conservative and you want the fiscal commission to succeed. You will have to agree to higher taxes as part of the bargain. But what should you aim to get in return? Here is my list. Substantial cuts in spending. Ensure that the commission is as much about shrinking government as raising revenue. My personal favorite would be to raise the age of eligibility for Social Security and Medicare. Do it gradually but substantially. Then index it to life expectancy, as it should have been from the beginning. Increased use of Pigovian taxes. Candidate Obama pledged 100 percent auctions under any cap-and-trade bill, but President Obama caved on this issue. He should renew his pledge as part of the fiscal fix. A simpler carbon tax is even better. Use of consumption taxes rather than income taxes. A VAT is, as I have said, the best of a bunch of bad alternatives. Conservatives hate the VAT, more for political than economic reasons. They should be willing to swallow a VAT as long as they get enough other things from the deal. Cuts in the top personal income and corporate tax rates. Make sure the VAT is big enough to fund reductions in the most distortionary taxes around. Put the top individual and corporate tax rate at, say, 25 percent. Permanent elimination of the estate tax. It is gone right now, but most people I know are not quite ready to die. Conservatives hate the estate tax even more than they hate the idea of the VAT. If the elimination of the estate tax was coupled with the addition of the VAT, the entire deal might be more palatable to them. One thing is clear: The Democrats in Congress would hate the five demands above. But that is precisely the point. The fiscal commission is giving the Democrats something of very high value: political cover for a major tax hike. If Republicans are going to give them that, they should get something very big in return. If the conservatives on the commission could achieve my five goals above, it might be a deal worth talking about. The Democratic Party is attacking some Republican congressmen for both opposing the stimulus bill and also helping direct some stimulus spending into their districts. Let me offer an analogy. Many Democratic congressmen opposed the Bush tax cuts. That was based, I presume, on their honest assessment of the policy. But once these tax cuts were passed, I bet these congressmen paid lower taxes. I bet they did not offer to hand the Treasury the extra taxes they would have owed at the previous tax rates. Would it make sense for the GOP to suggest that these Democrats were disingenuous or hypocritical? I don't think so. Many times, we as individuals benefit from policies we opposed. There is nothing wrong about that. Click here to read my latest column in the NY Times. Interested in an exciting teaching opportunity? Become a section leader for ec 10, the introductory economics course at Harvard College. The job is open to PhD candidates in economics, master's students in public policy, business, and related fields, and law students. The only requirements are a good training in economics and a desire to share your passion about the field with some of the best undergraduates on the planet. Past ec 10 section leaders have included NEC Director Larry Summers, Federal Reserve Governor Kevin Warsh, and CBO Director Doug Elmendorf, as well as the humble proprietor of this blog. I have posted a new paper, which Ricardo Reis and I have prepared for the new Handbook of Monetary Economics. Warning: For econonerds only. The Administration is taking two tax provisions from the 2009 stimulus bill -- expansions of the child tax credit and the EITC -- and claiming them as part of the "current policy" Bush tax cuts. And they are doing something similar for Pell grants: assuming that they will receive sufficient funding to pay out the maximum grant level set in the stimulus bill. The Administration didn't inherit these policies, they created them. And worse, still, they created them as explicitly temporary, under a stimulus bill which they claimed was meant only to help bring us out of this recession. Yet the White House wants to continue these policies, and they don't want to pay for them. So what do they do? They hide these policies in their baseline, in the hopes that they won't have to. When we talk of another depression. And everything's up for sale. That led to all of this trouble? Was a bursting housing bubble. But other than that, who can we blame? And what do they lament? With a house on Cleveland Road. For a small three-bedroom abode. Would sell for four times the price. "This may not be fair, but it's nice." It was good for our mental health. We had to know that it couldn't go on. If those prices were ever to stall. A recession would mean big trouble. Was cut to under two. That a refi boom would ensue. That caused long rates to rise. And that was the end of the refi boom. It came as quite a surprise. But banks still had money to lend. To keep short rates very low. His halo has less glow. Was a robust housing market. And a house was a good place to park it. The value would always be there. Or what you made in a year. "Just sign and see the cashier." That made the music play. For more than they had paid. And lots of money was made. Then Countrywide got in the fray. Helped make the trading brisk. Was traunched with well-measured risk. And that was the closing bell. Now where do we go? We really don't know. And prices will fall no more. Is down, it no longer grows. And we're not building any new homes. Starts are at 50-year lows. Since no one wants to pay. Is just from government red. Buying paper from Fannie and Fred. Still empty units to sell? Without much to say for certain. Not beginning or final curtain. Is that markets will make you humble. They will turn and fortunes will crumble. Is a notion that is not in dispute. For moral hazard and rules. You are damned if you do and damned if you don't. To be "pure" is a game for fools. That they want more retribution. Analysis from Dartmouth economist Matthew Slaughter. Keith Hennessey dissects the Administration's rhetoric. Again, green is last year’s proposal, blue is this year’s proposal, and dotted pink (30-years) and red (50-years) are historic averages. 1.The President is proposing significantly more spending than he proposed last year: 1.8% of GDP more in 2011, and roughly 1 percentage point more each year over time. 2.Spending is and will continue to be way above historic averages. At its lowest point in the next decade federal spending would still be 1.7 percentage points above the 30-year historic average. 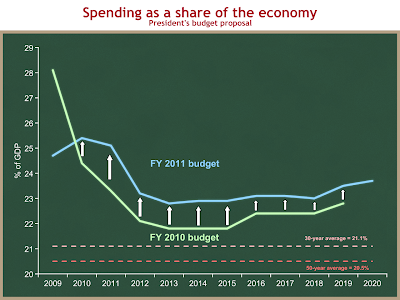 Over the next decade, President Obama proposes spending be 12% higher as a share of the economy than it has averaged over the past three decades. I have been running the introductory economics course at Harvard together with the very capable economist Silvia Ardagna. Sadly, Silvia is leaving Harvard next year to take a job in London. As a result, the economics department is looking for a new person to replace Silvia as head section leader for ec 10. The head section leader teaches one section of the course and has significant responsibilities for course administration. To learn more about this job opportunity, click here.